Cello wrapped. Six assorted fruit flavours. 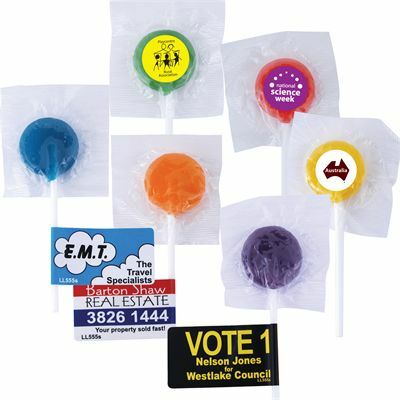 Each lollipop, approx 6 grams. Approx. 160 lollipops per kilo. Blue - Tutti Fruiti, Green - Lemon, Orange - Orange, Red - Strawberry, Purple - Grape, Yellow - Lemon. ITEM SIZE(MM) 27 Diameter (approx). PRINT AREA(MM) Round Label - Up to 16 Diameter, Background colour - 19 Diameter, Round Label - Up to 32 Diameter, Flag Label - 97L x 26H. LABEL SIZE (MM) Round Label - 19 Diameter, Round Label - 32 Diameter, Flag Label - 97L x 26H. COLOURS Assorted Red,Yellow, Blue, Green, Orange, Purple. LABEL COLOUR White. Request quote for more complex labels.